I thought I was going to miss the blackberry season as I’ve been so busy. Apart from eating the odd blackberry when I’ve been out and about I’ve not picked any this year – not until the day I made these blackberry & apple spelt pancakes with brown buttered cobnuts that is. Whilst I was perusing Ren Behan’s excellent new cookbook, Wild Honey & Rye, I saw a recipe for apple pancakes – well! I’ve got apples falling into the garden from next door’s tree and it seems a shame to waste them. What goes best with apples? Blackberries of course. Time to finally do a bit of brambling and make some blackberry & apple pancakes. But where do the brown buttered cobnuts come in I hear you cry? As it happens, I was sent some green cobnuts recently from Potash Farm. I was wondering what sort of recipe to create with them and asked for ideas on Instagram. Tattysquawk said she flash fried them in olive oil with a pinch of salt. Brilliant idea. Only I decided to fry mine in butter and use them to top my blackberry and apple spelt pancakes. They sizzled wonderfully while the butter browned and then suddenly started popping. I wasn’t expecting that. They became golden and somewhat to my surprise, wonderfully stripy. The fresh cobnuts are really good, but my brown buttered cobnuts are sensational. Raw, the cobnuts are crisp and slightly juicy and have a sweet and almost coconutty flavour. Kentish cobnuts are sold with their husks on during September and October. After that, they go darker and are sold in the form that most will recognise. If you want to try them while they’re still green, you better get your skates on, as I understand they are quite popular. Now I can see why. I’ve written about Potash Farm in previous posts, but I’d not tried their green cobnuts before. I’m really glad I have now. The farm is situated in the rolling Kent countryside and it grows a lot of cobnuts. It has an ever widening reputation for selling high quality nuts and produce made with nuts, both online and at their farm shop. I can attest that Potash Farm fudge is exceedingly good. Blackberry & apple spelt pancakes are easy to make. The only difficulty I had was having to cook them one by one; I could only find a little pan to cook with. If you use a normal size pan you should be able to cook three at a time. The nuts I left to last and they cooked really quickly. I made enough batter to make two days worth of pancakes so I could enjoy them again the next day. I’m so glad I did. The pancakes were delicious with bursts of blackberry surprising the taste buds every so often. The brown buttered cobnuts were the icing on the cake and married superbly with the apple & blackberry flavours as well as providing a contrasting crunch. Forget blackberry and apple crumble, these pancakes are fantastic, especially when topped with early season green buttered cobnuts. Ideal for late summer or early autumn. Place everything but the fruit, nuts and butter into a bowl and whisk until well incorporated. Stir in the apple and finally the blackberries. Add ⅓ of a tsp of butter to a non-stick frying pan and heat to medium. Place 2 tablespoonfuls of batter in the pan x 3. Cook for about 3 minutes or until bubbles appear all over the top of the pancakes. Flip them over and fry for a further 2-3 minutes. Place in the oven to keep warm whilst you repeat the process until all of the batter is used up. Add the final tsp of butter to the hot pan and throw in the cobnuts. Cook for about 3 minutes until the butter has browned and the cobnuts start to pop. Shake the pan occasionally. Pile the pancakes onto a plate, scatter with the remaining sugar and pour the golden cobnuts and brown butter over the top. You can easily double the recipe to make more if needed. I’m sharing these blackberry and apple spelt pancakes with Searching for Spice for Cook Once, Eat Twice. They also go to #CookBlogShare over at Easy Peasy Foodie. And this early autumn recipe has to go to Simple and in Season with Feeding Boys. If you make these blackberry & apple pancakes, I’d love to hear about it in the comments below or via social media. A photo is always good too. For more delicious and nutritious recipes, follow me on Twitter, Facebook, Instagram or Pinterest. This post was commissioned by Potash Farm. I was not expected to write a positive review and all opinions are, as always, my own. Thanks to my readers for supporting the brands and organisations that help to keep Tin and Thyme blythe and blogging. Those nuts look like mini hazelnuts..and if they have coconuty taste, then I am sure I will love them. These pancakes look wonderful! Thanks Angie. They are actually larger than hazelnuts and are absolutely delicious. Cobnuts are great for all sorts of reasons Kitty. They’re delicious and they are grown here in the UK. Your pancakes sound amazing and would be perfect for brunch. I love apple blackberry combinations with cinnamon any time. I can’t say I have tried cob nuts before but something to look out for now for sure. Yes, perfect for brunch Nayna. Cobnuts are well worth trying if you can get your hands on some. Blackberries and cobnuts, what a lovely autumn combination, and great in pancakes. Love the look of these! Thanks Kavey – I do love autumn for all the wonderful fruit and nuts. Thanks Eb. I’m still battling away with house stuff and haven’t at all got my act together with my poor neglected blog. I’ve never seen cobnuts before but they look lovely, I wonder if the local farm shop would have them. Your pancakes look perfect for breakfast this weekend, will give them a go for sure. All that autumnal fruit! Thanks Lucy. Your local farm shop may well have them. Did you have any luck? I love cob nuts, they are so creamy and delicious. What a nice idea to combine them with pancakes and blackberries! These look delicious! I’ve never tried green cobnuts before but will definitely look out for them now. They make such a lovely topping for the pancakes. Thanks for sharing with #CookOnceEatTwice! Gorgeous pancakes! So perfect for this time of year. I buy cobnuts at my local farmers market. I always try to buy food that’s in season. I love that you have used spelt. I use spelt flour all the time now especially for my weekly pizza (which my family loves). So pleased you’re now using spelt flour Alida. I’ve been using it for more years than I care to remember and it’s great to see other people coming on board. Who doesn’t like a good pancake recipe, right? You combined some outstanding ingredients which I will have to try soon! Thanks Agness. Don’t leave it too long or there will be no blackberries left and no cobnuts either. Oh I love these flavours for pancakes Choclette. They just sound wonderful. I am going to crave these all day! Pancakes are always a winner, but these are pure autumnal bliss. I have always wondered about cobnuts don’t think I have ever tasted them. The pancakes look heavenly too! They are particularly sweet and tasty and have the bonus of being grown in this country. 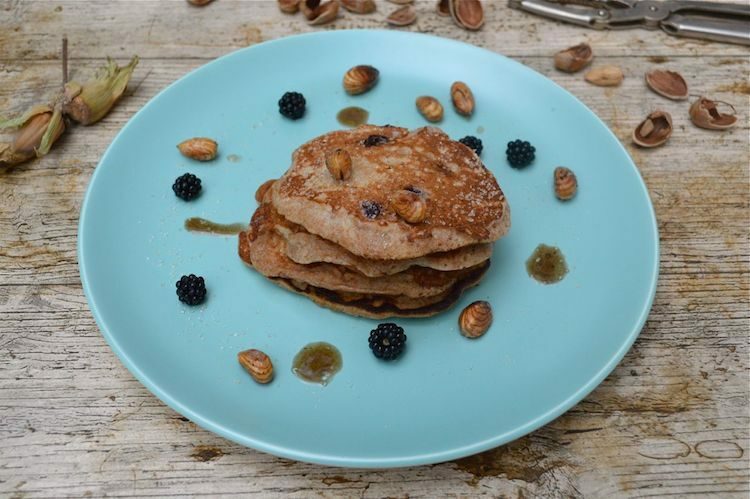 Love the idea of brown buttered cobnuts; these pancakes look truly delicious! Thanks Jan. I could eat a plateful of those cobnuts all on their own. 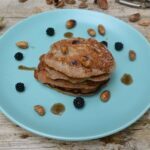 I have tried cobnuts years ago , but now am inspired to try them once again, love the sound of these pancakes and what a fab idea to make a larger batch to enjoy them twice! Thanks Manjiri. I’m always on the look out for getting more meals for my bucks. These look amazing. I love cobnuts so much! They are so good and the fresh ones are available for such a short season, it makes them extra special. Thanks Katie. Cobnuts are well worth trying, especially as they are one of the few nuts that are UK grown.